Dead Poets Society is a 1989 American drama film written by Tom Schulman, directed by Peter Weir and starring Robin Williams. Set at the conservative and aristocratic Welton Academy in the northeast United States in 1959, it tells the story of an English teacher who inspires his students through his teaching of poetry. 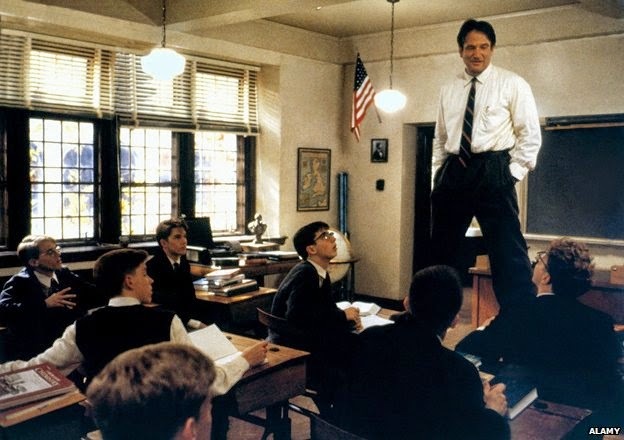 N. H. Kleinbaum wrote a novel of the same name based on the movie: Dead Poets Society. New York: Hyperion. 1989. N. H. Kleinbum, a graduate of Medill School of Journalism at Northwestern University, is a former newspaper reporter and editor. Her other novelizations include the Bantom Starfire title Growing Pains and D.A.R.Y.L. She lives in Mr. Kisco, New York with her husband and three children. 2. The main character, John Keating, was based on two of Schulman's teachers. 4. Originally, Jeff Kanew, who did Revenge of the Nerds, was going to direct it. 5. Dustin Hoffman was going to direct—and star in—the movie. 6. In the screenplay, John Keating is dying of cancer. 8. The movie is rife with literary references—both well-known and obscure. 10. A Decent Chunk of Williams' Lines Were Improvised. 13. Lara Flynn Boyle had a bit part in the movie, but it was cut. 14. Not everyone liked the film—Roger Ebert Especially. I walked out [of the movie] horrified that anyone would think that what happens in Mr. Keating’s classroom—or outside of it, because so many of his poetry-derived “life lessons” are taught outside the classroom, after all—had anything to do with literary study, or why I was pursuing a graduate degree in English. I think I hate Dead Poets Society for the same reason that Robyn, a physician assistant, hates House: because its portrayal of my profession is both misleading and deeply seductive.